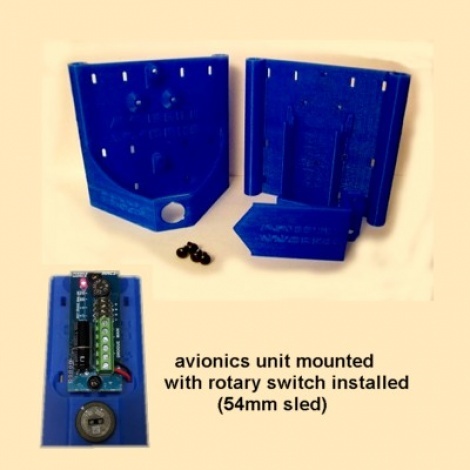 This Pre-Engineered, 3D printed Avionics Bay Sled System allows easy mounting of your electronics unit ready for quick assembly and integration into your rocket project. • Integrated 9V battery holder. • SW-2 "Rotary Switch" mount. • Rotary head is located for easy "vent hole" access on the pad. • Modular design allows sled to be moved from rocket to rocket easily. • Pre-slotted for easy wire routing or tie-wrap attachments. • Precision printed from durable and environmentally friendly PLA plastic. - Weight: with screws and battery cover ~ 45g. - Dimensions: 78mm (3.125") long x 85mm (3.4") wide x 39mm (1.55") deep. - Mounting: (2x) 1/4-20 all-thread on 75mm (3") centers. - Comes with (4) #4 trilobular screws and battery cover.